What you need to know before arriving or departing at Venice's international airport, including advice on reaching the city by boat, bus, or taxi. ABOVE: An aerial view of Venice's international airport, which is built on the edge of the Venetian Lagoon. INSET BELOW: An Emirates jet arrives in Venice, and a ticket counter for Venice's public bus and boat services. For many foreign visitors, flying to Italy means booking a ticket to Milan or Rome. And that's a shame, because Venice's Marco Polo International Airport is often a more convenient gateway. Why? Distance to the city center is one reason. The Piazzale Roma is just 20 minutes away by land taxi or airport bus, and the Lido, the Piazza San Marco, and other locations in the historic center are easy to reach via the Alilaguna airport boat. 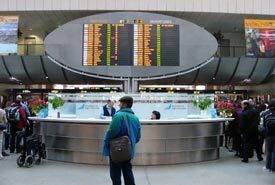 Marco Polo Airport is also more manageable in size than its counterparts in Milan and Rome, although it can feel like a Third-World airport if you're departing on a weekend or on a day when thousands of passengers have been disgorged by cruise ships. Consider yourself fortunate if you arrive or depart on a clear day, when views from the air can be breathtaking. You'll see the Dolomites, the Adriatic, and the Venetian Lagoon. You'll see land that's submerged at high tide, suggesting a Northern Italian version of Atlantis. And if you're on the right side of the plane, you'll see the city itself, with instantly recognizable landmarks like the Campanile di San Marco and the Grand Canal. Warning: If you have a luggage problem, filing a claim can be a frustrating experience . Not long ago, one of our suitcases didn't arrive on an Air France from Paris, and we had to stand in line for more than three hours to make a report. ABOVE: A large screen behind the information desk in the departures terminal tells where to check in for your flight. Warning: Like most airport terminals, Marco Polo was designed in an era of less intensive security procedures, and both ticketing and security lines can be horrendously slow during busy periods. On one recent Monday in late October, it took us an hour just to check in. We suggest arriving at least two and a half hours before your flight--or even earlier, if you're departing on a weekend, during high season, or on a transoceanic flight. Some airlines (such as KLM, Air France, and Delta) require you to check in at an automated kiosk or online before taking your luggage to the counter. We like to check in at a kiosk at least two hours before flight time, which ensures that we're near the head of the line when the counter opens. If you're connecting through another airport and airline to your final destination, you may find that the kiosk will issue a boarding pass only for your first flight. Don't be alarmed: When you take your luggage to the counter, the agent should be able to issue boarding passes for any additional legs of your journey. Two budget carriers, Ryanair and Wizz Air, use Treviso Airport (a different airport about 25 km away from Venice). Click the Union Jack for English-language information at the Venice airport's official Web site. If you have questions, see the airport's "Contact us" page.